Find files, news, sites and people - personalized for you and your organization. 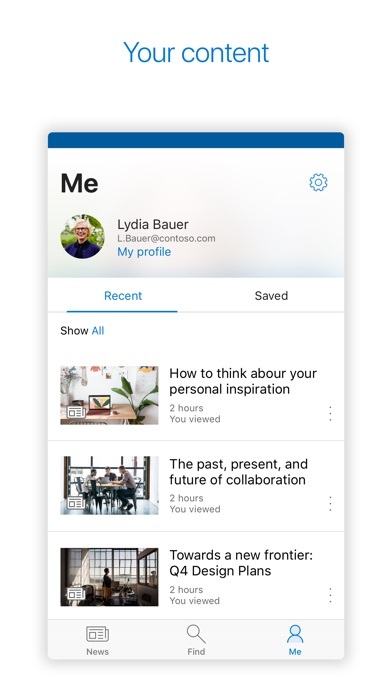 SharePoint infuses AI into the mobile app experience to keep you focused and productive while on the go. AI builds an understanding of what you work on, how you work, and how your colleagues' work relates to you. 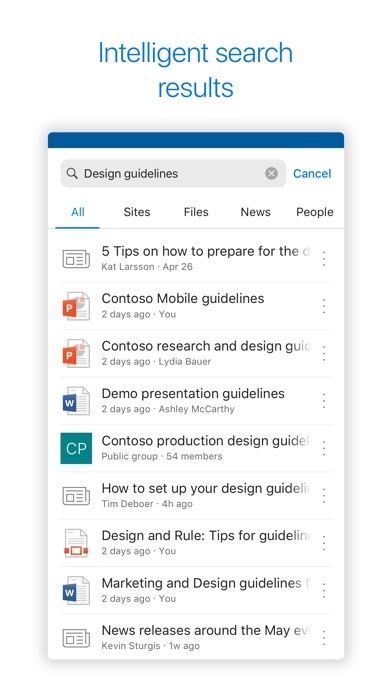 When you need expertise, content, or resources when you're on the go, SharePoint is a great place to start looking. 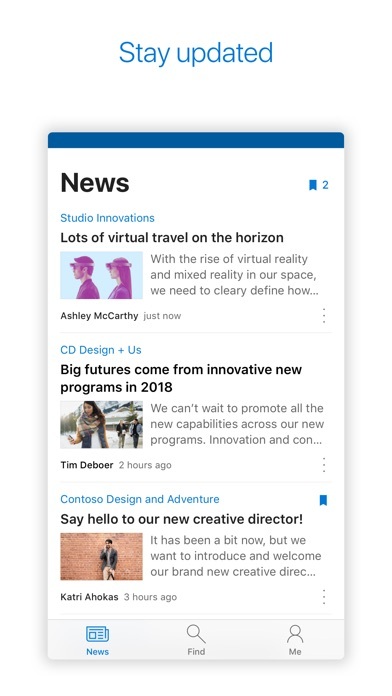 · Browse your sites, files, people and more to get back to what you were working on · Use search to find and discover important content · Access your personalized view of team sites, communication sites, and news posts · Tap on a user to get to their contact card and see who they work with and what they are working on · Create news posts on the go and share your updates, reports, status, and experiences with your team · Sign in to your SharePoint sites, whether they're in the cloud or on-premises. 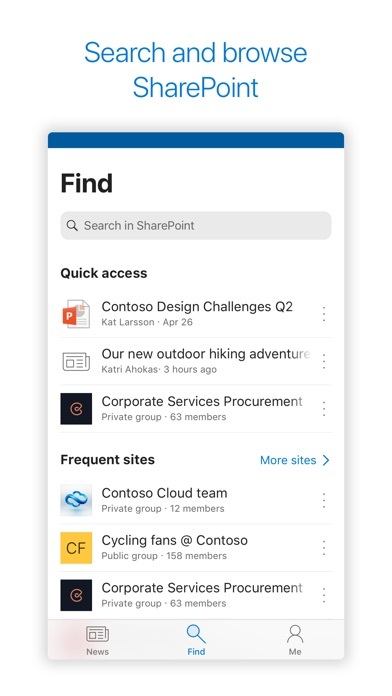 The app works with SharePoint Online and SharePoint Server versions 2013 and higher · Add multiple accounts, and easily switch between them What people are saying: The SharePoint mobile app has been featured in TechCrunch, The Verge, ZDNet, PCWorld and Computerworld. Over 2 years of app store reviews: "making collaboration easier than ever!!""" "keeps me connected with my office documents and coworkers" "seamless integration with other Office apps" "it's so easy and simple to use!!" 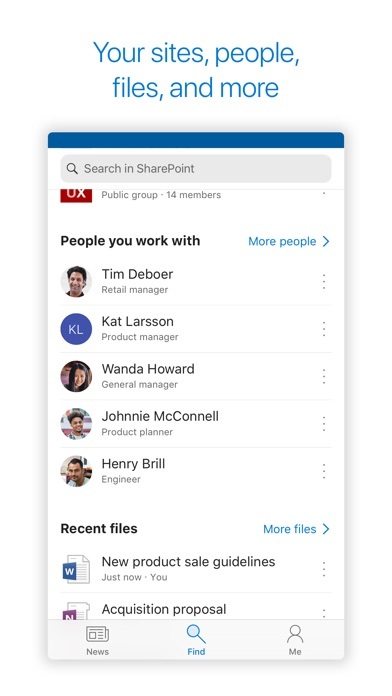 Note: To sign in to SharePoint, your organization needs to have an Office 365 subscription that includes SharePoint Online or an on-premises SharePoint Server. This app is provided by Microsoft. Data provided through the use of this store and this app may be accessible to Microsoft and transferred to, stored, and processed in the United States or any other country where Microsoft or its affiliates maintain facilities. While it’s super useful to have a document repository, navigation is endlessly difficult. On the surface it’s a clean, attractive looking piece of UI design but has little to no actual interactive features. It’s not possible to upload files, nor view them from the app. It’s a glorified file index. It leans heavily on other apps for basic functionality and beyond the first screen of each tab the interface is so badly laid out that half the time I can’t tell where I am or how I got there, or how to get back without quitting. Make this what it should be: a file manager and viewer. 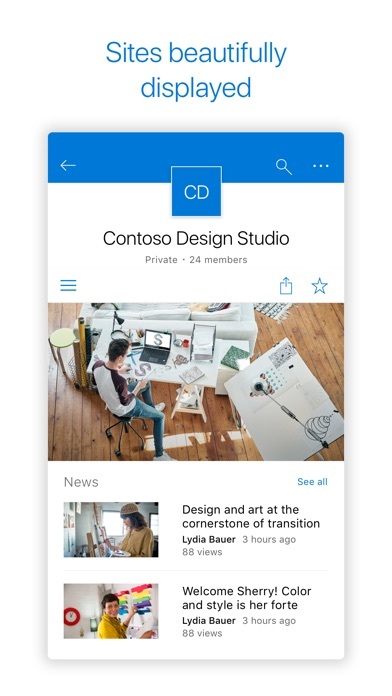 OneDrive with advanced file handing tools and an intranet browser. Courses don’t load. Impossible to get anything done. Scheduling activities out of sequence produces negative results affecting productivity ($$$). It’s great when it’s web based. But going through the iOS app will never connect. Asks numerous times for credentials and will start to connect but then kicks back to password credentials page. This is bull. I can no longer upload files or photos from my phone. Tried every troubleshooting step I could. Microsoft support is a joke. We use Sharepoint for our documents and working folders. It is easy to manage and easy to access.